Let's start with printer's productivity, which is defined not only by the printing speed, but also by the labor intensity of technological operations as to cartridge replacement and ink refilling, and also by the defect ratio caused by ink consumption in cartridges during printing process. If you don't have continuous ink supply system ciss mfc-j410w, sooner or later you will run out of ink and you will have to change the cartridge. At that, depending on the printer model, you have to make some cleaning technological operations. You could waste a lot of time. Furthermore, you should remember, that the printer has several cartridges with different dyes (or one cartridge with several different reservoirs) and that they will be consumed in different time. That is why, if your printer has several cartridges, you will have to change them more frequently. At that, if you have one cartridge with several tanks, you will have to throw it with the rest of unconsumed ink. Therefore, the average time, which you need to print one page, and moreover its cost grows significantly. Needless to say, that you can avoid these problems by using printer with continuous ink supply system cis brother mfc-j410w or the similar models, such as ciss for brother mfc-j615w and ciss for brother mfc-3360c. They will allow you to increase the productivity by 15-20%. 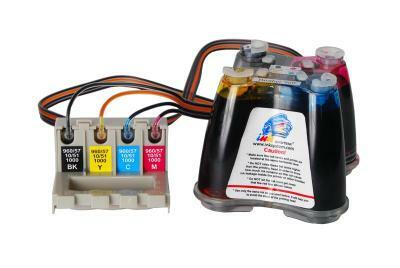 ciss ink system brother mfc-j410w has a detailed instruction in a set, which will help you to install it on your printer. It also has full ink set and all the accessory materials.